For this week’s “Photo Friday” by Cathy T, here are couple photos of a sweetgum tree. Latin name noted above. I came across this tree during a nature walk in Cape May, NJ last weekend. My husband and I went to the Cape May area for the first time. In search of some exercise, and the fact it was a cloudy day, we decided to hit up the Cape May lighthouse first, going up 199 steps to the top for some views. After, we discovered a nature trail nearby at the state park. Once our leg cramps subsided, we entered the path. The wooden laid walkways lead you through pine canopies and continue through marshes and swamp like areas. Well-maintained but still with its natural presence, this nature trail was peaceful and the right pace for us. We walked about a mile along various terrain experiencing shade, sun, water, sea breezes – and many birds, wildflowers, and unique trees. By the way, Cape May is known as a place to be for birdwatchers. Many bird enthusiasts were standing on a deck with binoculars in hand and facing the sky as they were taking counts where we began the walk. And on the trail, we would come upon a quiet bird spectator here or there. See www.BirdCapeMay.org about their observatory and bird species. The bird factor made the journey more pleasant and calming. As for myself, I wasn’t looking up – but out and around on the trail. 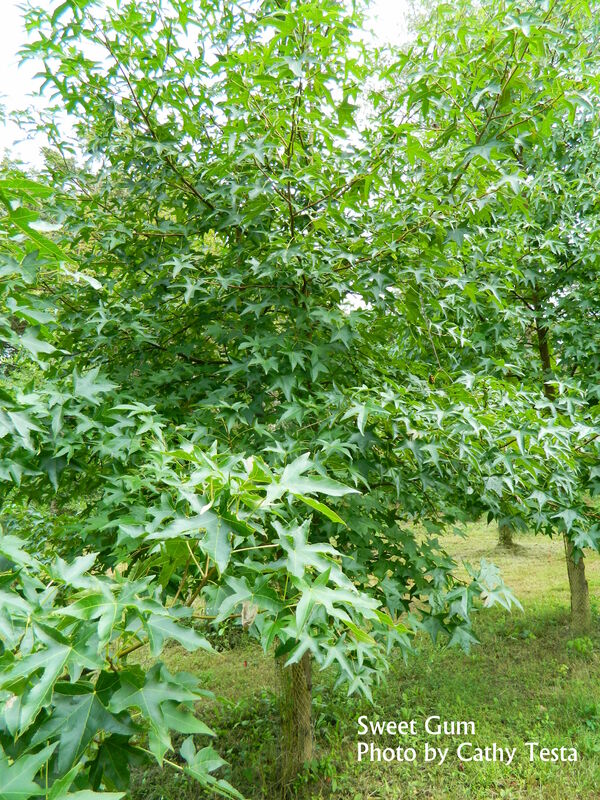 I was surprised to come upon sweetgum trees. I just didn’t expect it although they are known to grow near swamps and in lowlands, such as the place we were experiencing. And along the path, there it was. The big star-shaped leaves I’ve recognized before. I stepped off the path to take a closer look and a photo. For some reason, I felt like I may be breaking a rule by going off the wooden trail to venture into the woods, but I couldn’t help myself to take a closer look (and some photos of course). Later, as I continued further, I came across a stand of them. They were aligned in rows in open areas and being protected. I’m not sure why, but they were surely being grown and tended by a specialist for some reason. This tree is used for timber production and valued for its ornamental qualities. It is possible they took seedlings or root sprouts to keep them growing in the area since they were abundant and naturally occurring. Back to the leaves of the sweetgum. It is the feature which made me stop long enough to lose track of my husband who was far ahead of me now on the trail. 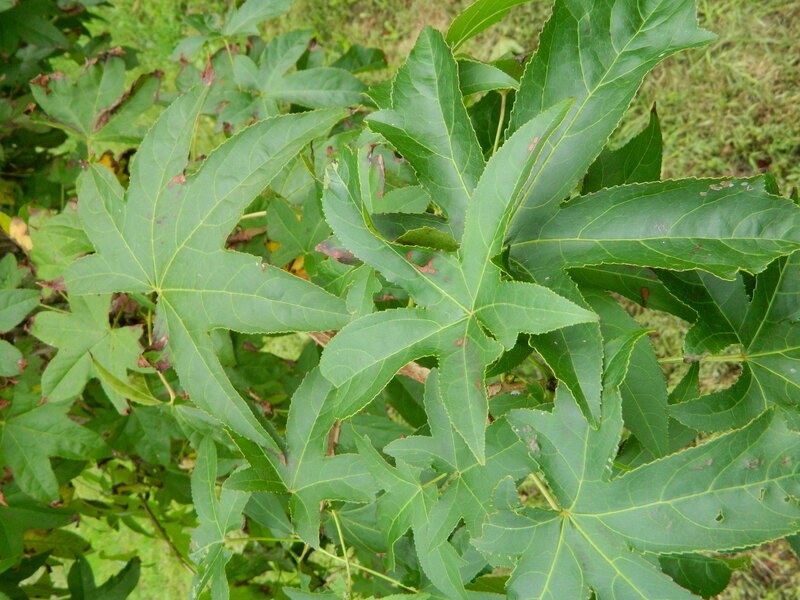 The leaves on sweetgum trees are rather large – a nice hand size and star-shape. This is the reason I like them – their foliage power. Although the leaf color is a basic green in season, the fall color is very pretty – turning shades of pale yellow, soft red, deep wine, and perhaps some bronzed highlights too. Seeing the leaves made me recall a mature, very large sweetgum tree situated on a hill at the UCONN campus in Storrs, CT. It took a couple of minutes for me to remember the tree as I was taking photos of the one on this Cape May trail, then it hit me – I remembered collecting the fruit seed cases from the ground at the campus that fell from the tree. They are round (as big as gum balls), hard, prickly or spiked, with a little stem attached. The balls (fruit seed cases) are woody and useful for winter decorations. Some folks may find them a nuisance on the lawn because they create litter so to speak, but to me they are a natural resource useful holiday decorating, plus they are interesting. Spray them with some glitter gold paint, and they are perfect for wreaths and container gardens stuffed evergreens in the winter months. The sweet gum tree gets its common name because – as you may guess – the resin/sap from its bark smells and tastes like gum! To experience this, you have to cut or wound the tree’s bark which I do not recommend, nor have I tried, but legend has it this was used like chewing gum. Also, this tree has been found in fossils – so it is a dinosaur, so to speak. And, it can get as large as a dinosaur. It grows to between 60 to 70 feet tall. The one at campus is huge, stately, and worth remembering. It needs lots of space because it grows a wide and spreading root system. It is not for tight spots, or shade, but can handle flooding, seaside breezes (if protected) as these were on the trail. To read more specifics about this tree, visit this line:http://plants.usda.gov/factsheet/pdf/fs_list2.pdf. This large, deciduous tree with ornamental qualities and useful craft offerings, great star-shaped leaf configuration, and fall coloring later in the season, is available for our climate. A zone 5 tree, you can find cultivars like ‘Frosty’ which has marbled and speckled variegation on the leaves, or ‘Silver King’ with white-edged leaves, and even ‘Slender Silhouette’ with a tall pillar shape, at tree farms such as www.brokenarrownursery.com in Hamden, CT. Or ask your local nursery contact if they would order one for you if possible.